There are food festivals and there are food festivals and then there is World on a Plate (WOAP) that is giving you so much more than just a food festival. Scheduled across today (June 4th) and June 5th in two expansive venues of JW Marriott and UB City WOAP has been created by Gold Rush Entertainment and brings to the city Australian chefs, culinary sensations and judges of the much loved Masterchef Australia - Matt Preston, Gary Mehigan and George Calombaris. The business center at JW Marriott was abuzz with anticipation yesterday (June 3rd) at the press conference for the announcement of WOAP. 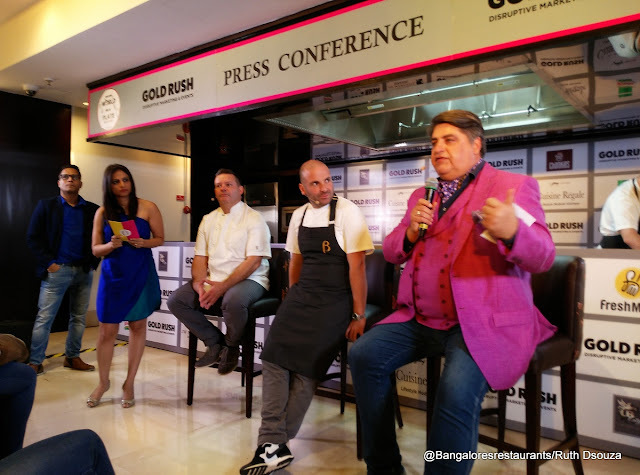 Kiran Soans, the CEO of Gold Rush explained how the idea for such a food festival sprung from the stupendous success of George's earlier visit. 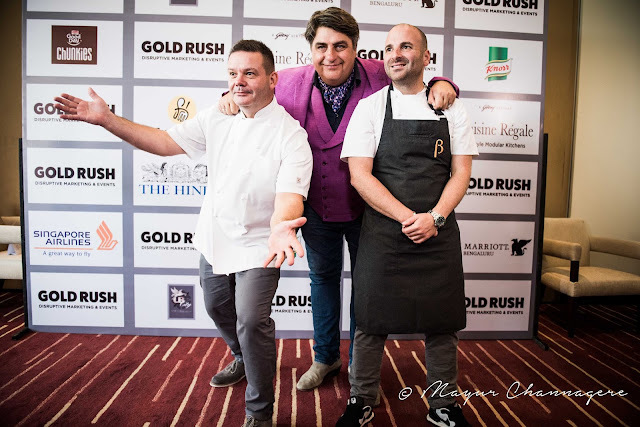 The idea this time around was to get all three popular personalities on a single platform and create a culinary extravaganza unlike any other. 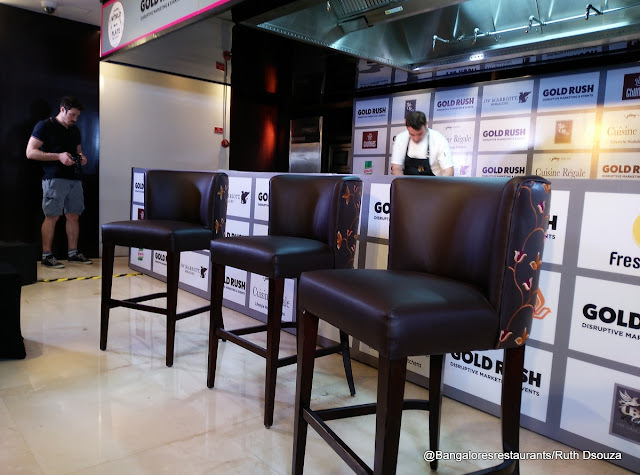 The event will also culminate with a Best Restaurant Award being given out based on tastings by the celebrity judges. 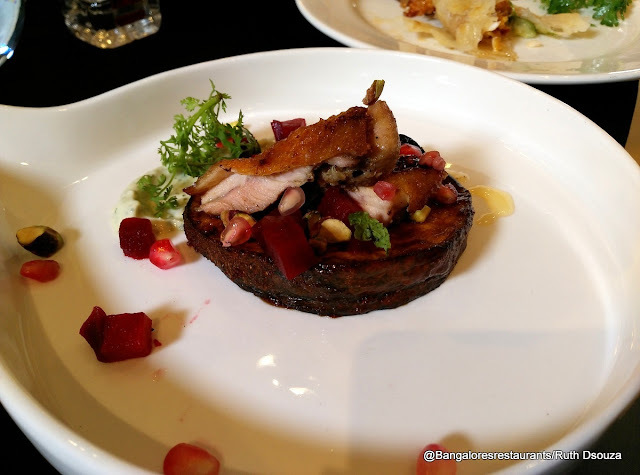 WOAP will have over 15 top end restaurants of Bangalore city showcasing their signatures and more, at prices that will not have you break the bank. 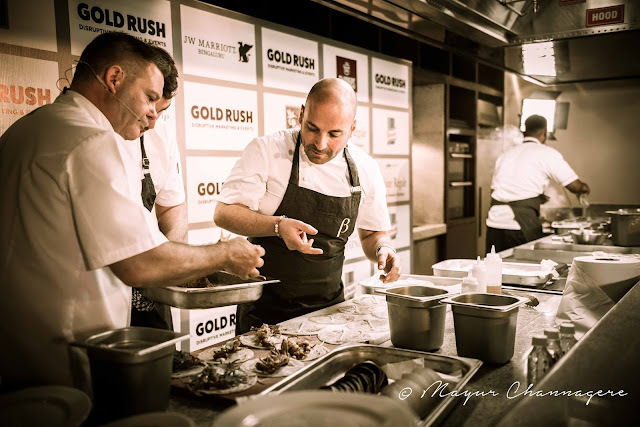 There are 1-hour masterclasses with each of the Australian chefs that you can purchase tickets to, tete-a-tete sessions are also being organized and not to mention that you can spend the day between these two venues and indulge in breakfast, lunch and dinner! George, Gary and Matt were a complete delight at the interaction talking about the love they have received in the country for their show and for them. They also indulgently spoke about their love for Indian food and how they have seen it grow in popularity on the international spectrum as well. In fact, here is a video of Gary Mehigan telling us just how overwhelmed he was by his visit to Russell Market in Bangalore and the diversity of food he has come across in India during his travels for his show Far Flung. 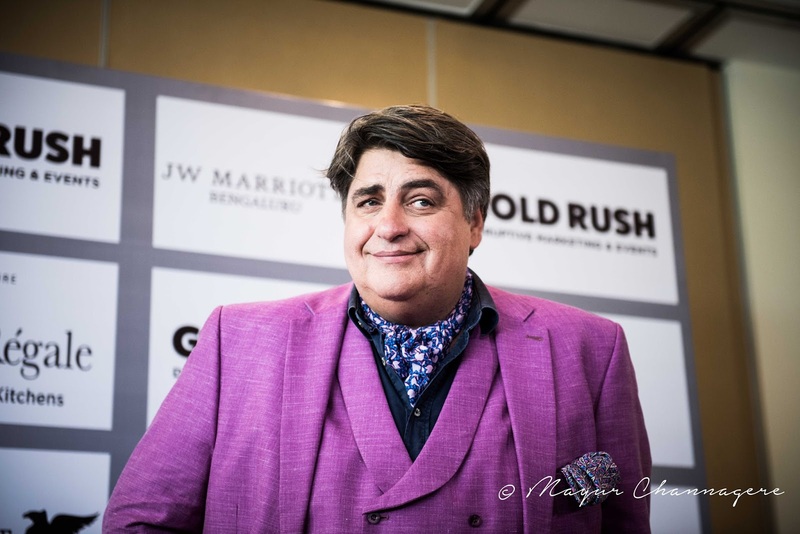 George too was equally vocal about the love India has shown Masterchef and how much of love Bangalore in particular has shown him. In this video you hear this and more! The press conference was essentially a discussion on all things food. Gary, Matt and George were all praises for the Keralite chef responsible for their breakfast at the JW Marriott that morning and couldn't stop gushing about brilliant their start to the day was. Additionally, Gary and George each came in with their sous chefs and gave us a sample of a dish they will be whipping up during the course of their interactions and masterclasses. Take a look at what you have in store. We began with George's rendition of a classic Greek dish, usually made with Pita Bread, but today improvised on and presented in a paratha wrap. 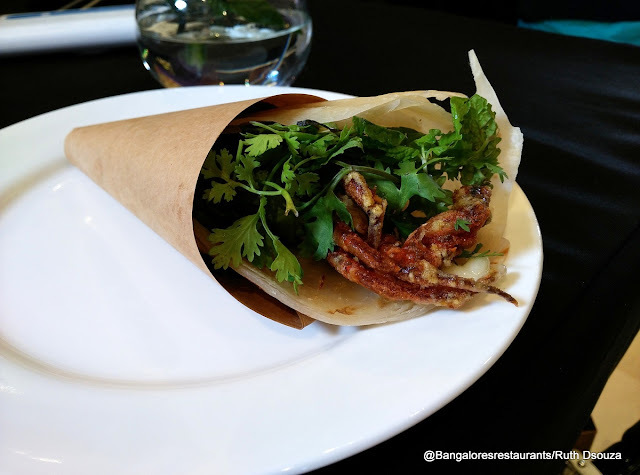 Soft shelled crabs that are batter fried and crunchy and wrapped in soft parathas with a tangy dip and finished off with fresh coriander. Matt Preston wanted to make a dish that would go well as a vegetarian dish and with a protein as well. The recipe is adapted from his latest book and uses roasted pumpkin on the base. The original recipe has a Mediterranean spice mix to it. Here Matt decided to Indianize a bit and go with a masala mix made at a local old age home. The marinade includes some spiced honey and the chicken is brushed with kokum vinegar (if I am not wrong). 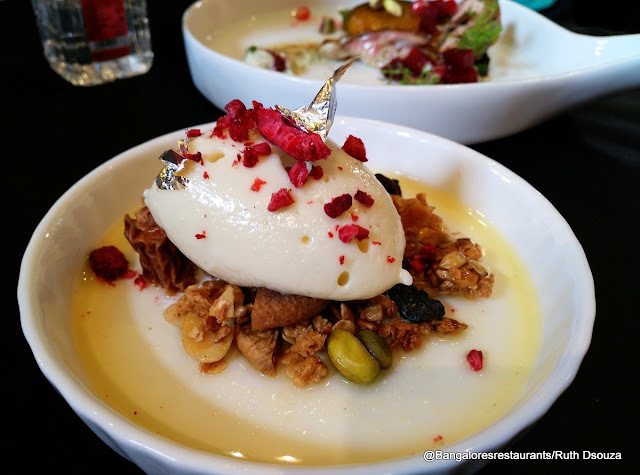 George created a sweet treat of a white chocolate cheese mousse placed on a granola of fruits and nuts in a syrup with a touch of Indianess with the varq. A fabulous end to this lovely tasting. This wrapped up the very fun press meet and announcement for WOAP. The festival is on June 4th and June 5th at JW Marriott and UB City. Make your way there for some great food and of course a chance to meet your favourite culinary heroes.